Pulling off accessories like the water pump. 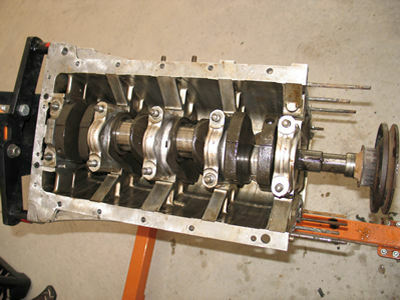 The rods need to be unbolted from the crank and then the crank’s bearing girdles can be unbolted from the block. he main pieces of the engine (block, crank, rods, new pistons, timing cover and oil pan castings) have been loaded into our wagon for a trip to the machine shop. Last night we disassembled the bottom end of our Alfa engine. What we found wasn’t that pretty, but we weren’t expecting great things either. The pistons looked OK in terms of wear, but the mix of oil and coolant caused some rust on the rings and rods. The main bits of the engine are now going to be delivered to the machine shop. The crank and block will be checked for bearing clearances and the entire block/pan/timing cover pieces will be cleaned in a commercial hot tank. 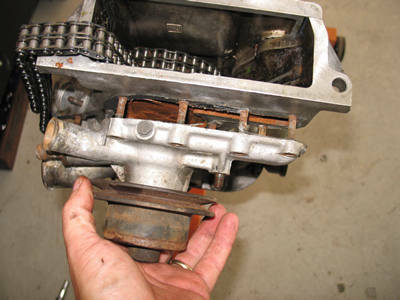 This will remove all of the residue from the coolant/oil problem and get it ready for a fresh start.